Caiman free games: Circus by TDK-Man. It looks like a breakout, but with jumping clowns instead of a ball. 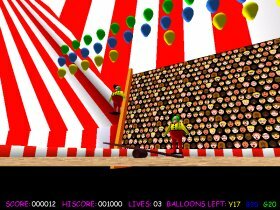 The object of the game was to pop the balloons which scrolled across the top of the screen using two clowns which bounced each other off a seesaw which you moved back and forth across the bottom of the screen. 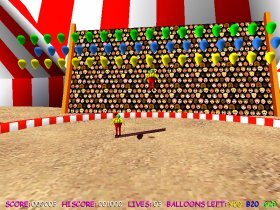 TDK-Mans Circus is een zeer mooie 3D remake van Atari's Circus. Het gelijkt op een Breakout, maar nu met springende clowns in plaats van een bal. Twee clowns springen op een springplank en moeten trachten zoveel mogelijk ballonnen kapot te krijgen.